It is natural to start the visit of a wine fair with the sparkling wines and in Istria only Peršurić winery is producing them. The owner, Đordano Peršurić, uses only the traditional method where the precious bubbles are formed by the yeast during the long and slow (at least 9 months) secondary fermentation in the bottle. The first I tried was Misal Prestige Extra Brut made of 70% Chardonnay, 15% Istrian Malvasia and 15% Pinot Noir. It has strong varietal aroma, with notes of yellow fruits and bread crust. On tongue crisp with nice minerals, light to medium body, excellent as an aperitif. Price: 90-130 kn (12 – 18 euro) without tax. I prefered the second one – Misal Millenium Brut (70% Istrian Malvasia, 15% Chardonnay, 15% Pinot Noir), where aroma was more complex and austere, herbacious, with notes of white flowers. Medium body, 8 g of sugar in liqueur d’expédition remains almost unnoticed since it is balanced with great acids and salts. Goes well with all kind of seafood (shrimps, crabs, lobsters, mussels, clams, squids…). Price: 90-130 kn (12 – 18 euro) without tax. 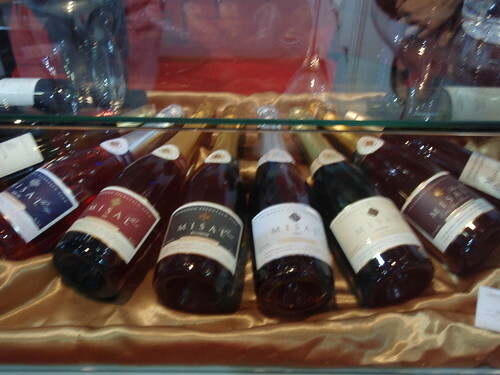 At the end there was a sweet surprise – Muškat Peršurić, a dessert wine (raisin wine – vino passito). It is made from dried grapes of Yellow and White Muscat. Apart from varietal aroma of muscat, there is also khaki fruit, dried figs and apricots that are contrasted with fresh notes of agrumes. In mouth the sugar is well equilibrated with acids and mouthwatering minerals, and high alcohol content (15.5 %) is hardly noticed. Long finish. Full body. Excellent! Goes well with cakes that have some caramel, or dried fruits in it. It is such a hard stuff that it would go well even with some chocolate cake, for example with Sacher. Price: 90 kn (12 euro) without tax.